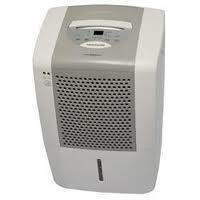 The Frigidaire FAD504TDD Dehumidifier has always been a well respected and widely used model. It is Energy Star® qualified and has all the features you would expect to find in this type of appliance. It has been replaced by the FAD504DUD, a slightly more compact but basically similar unit. It has given excellent service to many satisfied users but has now almost disappeared from vendors shelves although there are still some pre-used or reconditioned examples available. For anyone looking for a relatively cheap unit for a basement or other area of up to 1000 square feet a used 504TDD, at the right price, will be as good a choice as any. Naturally you will want to know about its features and performance before you buy so I am keeping this page up as an independent reference to meet that need. You will find all the information you need here including full specifications, my review of this model and a link from which you may download a copy of the user's manual. This feature allows you to choose the moisture level you want the appliance to maintain. It cycles on and off to keep that level constant. If you don't want to empty the bucket every day you simply attach a hose to a port in the casing and run the hose to a nearby floor drain. In cooler temperatures this protects the unit from damage caused by ice on the refrigeration coils. This does not mean that the FAD504TDD is a good choice for a cold basement, below 65°F. This is of fairly limited value but will trap some bacteria and other unwelcome particles. Easy to use soft touch controls for every function. Includes a digital humidity display. A simple timer that allows you to program the appliance to run at convenient times of the day. Large models are quite heavy but the two handles and caster wheels make movement of this unit a little easier. Reviews written by users have always been very positive about the FAD504TDD. It is used mostly in basements and is said by every reviewer to be powerful and effective. Many reviewers complained about the noise made by this model. The electronic controls are particularly popular and reviewers describe them as "easy to use". Some users report faults appearing in the first few months of use but generally reliability is said to be OK.
Few dehumidifiers get more positive reviews than the Frigidaire FAD504TDD. It seems almost a shame that Frigidaire decided to change it. The FAD504TDD does what it does well, not spectacularly but well. More importantly it has no weaknesses; more than can be said for most of its competitors. I cannot guarantee that a used model will have no faults but in new condition this was a model that I recommend without reservation. If you can't find a 504TDD take a look at the FAD504DUD. Click here to read my review of the 504DUD which, I am hopeful, will prove a worthy replacement for the Frigidaire FAD504TDD Dehumidifier.